If you’re looking for a great addition to your grilling arsenal, then the Weber Q 2400 Electric Grill is a great tool to have in your supply. This easy to use grill is assembled from the moment you remove it from the box and ready to start grilling your favorite items. It is portable so you can take it anywhere there is power to grill up your favorite burgers, dogs, and veggies. Whether you are in a very small apartment with a balcony or you want to grill on the go, this Weber electric grill offers the versatility you’re after. In fact, one of my good buddies bought this grill in 2016 and really liked it. He said he and his wife would bring this grill to their folks place and grill up veggies for them. Sometimes they would bring to their media room and prepare little sliders for the family. That is a reason right there to own this portable grilling appliance. One of the frustrating things of a grill can be cleaning up after you’ve finished cooking. With the electric grill by Weber, that is no longer an issue. The removable catch pan allows you to easily clean up any grease or food trappings you may have after you’ve enjoyed your meal. You can simply remove the pan, clean it up and replace it after doing so. There’s no need for scrubbing or harsh chemicals. You can easily remove the pan from under the grill and have it ready to go in no time. Not everyone who wants to or loves to grill has a huge backyard patio to use for large grills. This is where the Weber Q 2400 Electric Grill comes in. You can still enjoy a backyard BBQ even if your backyard is very small. Whether you’re on the balcony of your apartment or in a lot of your favorite home team, you can enjoy a deliciously cooked meal. The grill itself is very compact but it still offers ample grilling space for all your favorite foods. Simply plug it in and grill up delicious meals for your whole party. Amazon offers over 311 customer reviews to help you understand how this grill works in real life situations. With over 311 reviews listed, the overall rating for this Weber 2400 Electric Grill is 4.5 out of 5 stars also making this grill an Amazon’s Choice. 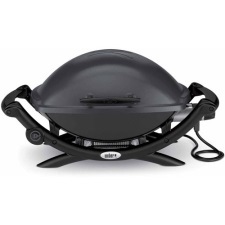 Most of the reviews are very positive and highly in favor of this grill. Overall, the people who have bought the grill are pleased with their purchase. They feel it is a great addition to their smaller patios, decks, or balconies where open flames are not allowed. They can still get a grilled dish while living in the city. A few of the negative comments include items that state the grill is too powerful for their home outlets, needs to heat longer than originally thought, and some had trouble with it cooking evenly. While most people love the grill, there are a few who have had issues with it not heating as quickly as it should or not staying at a consistent temperature throughout cooking times. Others also mentioned that sometimes it would go to a higher temperature than others but there was no indication as to why it varied. On the positive reviews, people who own the product had this to say … “Weber will always be first!” … “I love it” … “Don’t miss charcoal or propane” … “Excellent alternative to gas grill” … “Would definitely purchase again”. If you’re living in an apartment or townhome where open flames are prohibited, the Weber 2400 Electric Grill seems like the perfect addition to your home. You can still have friends over for delicious grilled items and stay within the regulations of your home. There’s no need for pricey charcoal or propane or finding ways to store them when you’re not grilling. The Weber Q 2400 Electric Grill does not take up a lot of space and it is convenient for traveling if you want to take it along with you. You can use the grill anywhere there’s a power outlet and you have ample space to cook a variety of items. It is convenient, lightweight, and built with a durable material to last for years to come.